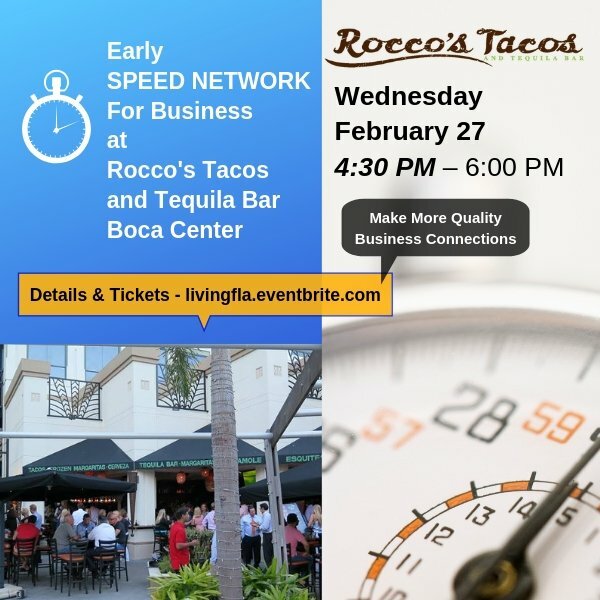 Join us Wednesday, February 27th, 4:30pm to 6pm for a Special Business Speed Network at Rocco’s Tacos and Tequila Bar – Boca Raton. ** Please note this special time from 4:30pm to 6pm. All guests should arrive on time to take full advantage for this speed Network. Tired of the same old Network Events. Find out why everyone loves Speed Networking for Business! This is a Fast, Fun Business Network for All Business Professionals. Talk for 3 minutes then move to your next potential business connection!! **You will get to meet and talk with every person at the event. *This is a private Speed Business Network Event. $5 Special Early Ticket Price (1 Ticket for $5) while they last. $5 Special Early Ticket Price (2 Tickets for $10) while they last.